Just about every charitable issue gets a music project, or a single these days. But here ROBIN GEORGE has gathered no less than 50 artists of various genres for a good cause. Members and ex.members of bands like URIAH HEEP, UFO, DIAMOND HEAD, QUIREBOYS, and ASIA, to mention but a few, have all contributed. The main material comes from Robin´s back catalogue, but there are also added specials, and specially written songs. As further evidence of dedication all profits will go to BCAT, Haven House and the Compton Hospice. Those who expect only hard rock or thereabouts will have to reconsider, the main object here is musicianship, and not distorted guitars. 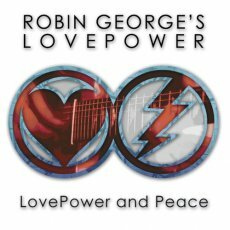 The title track maybe gentle rock with a message, but it is also proof of Robin´s dedication and the generosity of the artists involved. The voices of Ruby Turner and Jaki Graham add dimensions and the refrain could go on forever. It is fascinating to hear Robin´s old chestnuts in new or at least slightly different versions. Anyone not penchant to “Cocoon” or “Heartline” ought to see a doctor. Choirs of famous musicians and over 200 schoolchildren add credibility to the cause, and seldom has “With a Lilttle Help from My Friends” sounded so true. Or on his own with the LovePower Band, as they excell in a very emotional "King´s Call". I personally fancy the “return” of David Byron (R.I.P) in the soft and very suitable “Tired Eyes”, as well as hearing one of his successors to the Heep, Pete Goalby, make the most of “Mona Lisa Smile”. The aspiring rocker will probably like “Alice” and the MARSHAL LAW track “No Justice”. Most people will enjoy the album. It is a good thing that enjoyment is also giving a helping hand here. The album is a solid four, the cause is a solid 5/5.